Cook macaroni and cheese as directed. Add creamed corn; mix well and put in a casserole dish. Cover with bread crumbs and bake 12 minutes (about 350°). 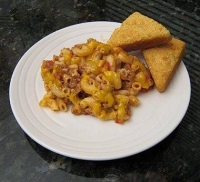 Recipe categories: Cheese, Pasta, Elbow macaroni.